Politicians on both sides of the aisle — along with foreign leaders, including Russian President Vladimir Putin — are mourning the late Friday night passing of former President George H.W. Bush. President Trump, who has been publicly critical of the Bush family, tweeted that Bush "led a long, successful and beautiful life. Whenever I was with him I saw his absolute joy for life and true pride in his family." President Trump and first lady Melania Trump said in a statement that Bush's "example lives on, and will continue to stir future Americans to pursue a greater cause." Trump also tweeted that Bush's "accomplishments were great from beginning to end. He was a truly wonderful man and will be missed by all!" Former President Barack Obama said in a statement that Bush's legacy of public service "may never be matched, even though he'd want all of us to try." The Clintons said in a statement that "[f]ew Americans have been—or will ever be—able to match President Bush’s record of service to the United States and the joy he took every day from it." "Rosalynn and I are deeply saddened by the death of former President George H.W. Bush. His administration was marked by grace, civility, and social conscience. Through his Points of Light initiative and other projects, he espoused a uniquely American volunteer spirit, fostering bipartisan support for citizen service and inspiring millions to embrace community volunteerism as a cherished responsibility. 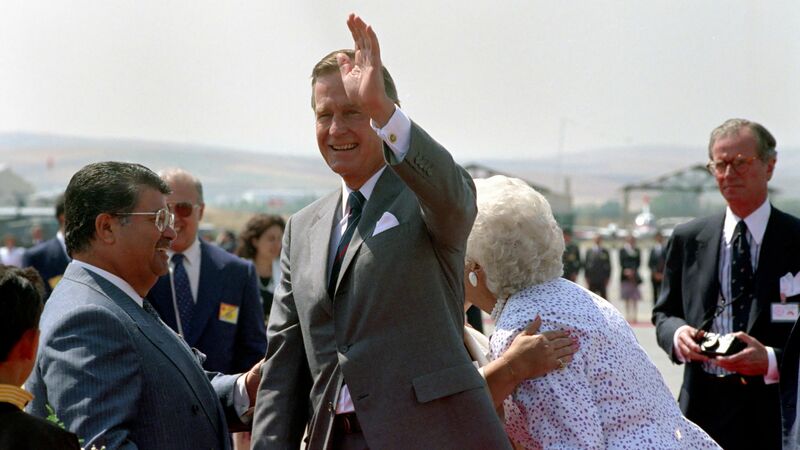 We again extend our heartfelt condolences to the Bush family." Russian President Vladimir Putin said, in a statement to President George W. Bush: "I was lucky to meet your father more than once. I remember with particular warmth how he organized our meeting in his wonderful estate in Kennebunkport." Accept the deepest condolences over the death of your father - George Herbert Walker Bush, the former US President. An outstanding man who had served his country faithfully all his life — armed with arms during the war years and in high government positions in peacetime, passed away. Leading the United States at one of the most important stages of world history, he showed political wisdom and foresight, sought to make informed decisions even in the most difficult situations. Realizing the significance of the constructive dialogue between the two major nuclear powers, George Bush Sr. did much to strengthen Russian-American relations and cooperation on international security issues. I was lucky to meet your father more than once. I remember with particular warmth how he organized our meeting in his wonderful estate in Kennebunkport. The fond memory of George Bush Sr. will forever remain in my heart and in the hearts of my countrymen. At such a sad time, I would like to convey the words of sincere sympathy and support to all members of your large family. Let courage not leave you in the face of this heavy, irreplaceable loss. French President Emmanuel Macron said Bush "was a world leader, who strongly supported the alliances with Europe." British Prime Minister Theresa May called Bush "a true friend to the UK...His statesmanship, wisdom and friendship will be much missed." Former Vice President Al Gore said he'd remember Bush "for his personal kindness and for his love of this country." Secretary of State Mike Pompeo said Bush "was one of America’s most consequential and dedicated public servants." "Devoted husband, loving father, steadfast friend, exemplary patriot: this is how I will always remember President George H. W. Bush. Whether he was serving in the skies over the Pacific during World War II, protecting America at CIA headquarters, or leading our nation in the Oval Office, President Bush was one of America’s most consequential and dedicated public servants. In his private life, he was a devoted family man who exuded kindness and respect to everyone he met. I am privileged to have known him as a friend, and I will always treasure the special bond we shared of having led the world’s finest intelligence service. Though our hearts are heavy today, we take comfort in knowing he is no longer apart from his beloved wife Barbara. My thoughts and prayers, as well as those of my State Department colleagues, are with the entire Bush family." Defense Secretary Jim Mattis said Bush's example "will long guide our Sailors, Soldiers, Airmen and Marines for how to live without regret." Energy Secretary and former Governor of Texas Rick Perry said, "We all were better knowing this fine gentleman. Gig ‘em & God Bless." Texas Governor Greg Abbott said Bush "was a friend to all he met, he embodied class and dignity." The U.S. Navy tweeted: "Fair winds and following seas, Sir. We have the watch." Former CIA Director John Brennan called Bush "an American who made us all proud." Senate Majority Leader Mitch McConnell said Bush "brought clear-eyed, principled leadership to a nation and world in transition," as president. Senator Chuck Schumer said that "even when he opposed your views, you knew he was doing what he thought was best for America."